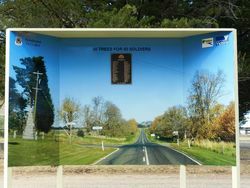 The Avenue of Honour was planted by local residents to commemorate those from the district who served in World War One. The avenue was officially opened on the 16th September 1918. Fifty mahogany gum trees were planted on both sides of the road but they became grub infested and were later replaced with elms. The avenue was re-dedicated in November 2001. A short time ago what is proving to be a most useful and active organisation was formed at Drummond under the title of "The Drummond League" its platform embraces many commendable objects, predominant amongst them being patriotism and the furtherance of all movements beneficial to soldiers either in the way of repatriation or acknowledgment of the great service they have rendered their country and empire. In pursuant of the League`s determination to do all in their power to honour the memory and acknowledge the service of their district soldiers they recently decided to plant an honor avenue of trees, and this was opened by the Hon. 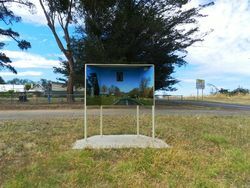 D. McLeod M. L. A., on Monday afternoon last in the presence of a large attendance of local residents and visitors, from Kyneton, Daylesford, and other places. Apologies for non-attendance were received from the Premier (Hon. H. S. W. Lawson), Mr.E. Jowett. M H.R., and Mr.S. Langley, secretary and engineer to the Shire of Glenlyon. The avenue extends from the State School to Drummond Post Office, a distance of about twenty-five chains. Fifty trees have been planted, twenty five on each side of the road. They are all mahogany gum and are set a chain apart. The mahogany gum plants were recommended by the curator of the Kyneton Gardens as being most suitable for the Drummond soil. The trees are enclosed with substantial guards. The timber for the latter (swampygum and messmate) was cut by the residents in the bush and carted to Kyneton,where it was sawn into pickets at a cost of £13/10/. The guards were erected and the holes for the trees sunk by the residents. 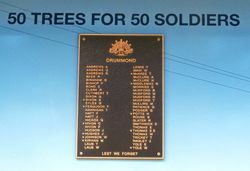 The two trees at the northern end near the school will bear the names of General Birdwood and General Monash, and these were planted respectively on Monday by the Hon.D. McLeod and Cr. J. J. McCarthy, the other trees all bear the names of district soldiers, and were planted by relatives-or, in cases where those were not present, by schoolchildren who drew lots for the honor. Cards bearing the names of the soldiers to whom the trees were dedicated were attached to the guards, but these will be replaced later on with metal plates suitably inscribed. The following are the names of the district soldiers whose names are to be inscribed on the plates:—Arthur Andrews, George Andrews, Roy Beer, George Bingham, Fred Bishop, Reuben Clark, William Clark, Thomas Cuthbert, George Dixon, Samuel Dixon, George Eyles, Frank Ferguson, Thomas Hannigan, Frank Hatt, Josiah Hatt, George Hickox, Charles Hivon, Frank Hivon, John Hudson, John Hughes, Joseph Jenkins, Matthew Kirwan, Thomas Laub, Wiliam Laub, Thomas Lewis, William Main, T. McAree, Arthur McClure, Norman McClure, Robert Middlemass, Benjamin Mudford, Mark Mudford, Ralph Mudford, Thomas Mudford, Matthew Mullins, Donald Patience, Herbert Podger, Hedley Potts, Stanley Rowse, Richard Slater, Edward Smithwick, Evan Thomas, senr., Evan Thomas, junr., Thomas Trickey, Melville Whyte, Edward Yole, William Yole. Of this number Ptes.S. Dixon, F. Ferguson, C. Hivon, I. Hughes, M. Kirwan, R. Middlemass, H. Potts, E. Thomas, junr., and W. Yole have made the supreme sacrifice. Excerpt from the Kyneton Guardian, 19 September 1918.